Whitening strips are among the most popular health and beauty products in Shelby. Brightening up your pearly whites is a great way to give your smile a boost, and with all the over-the-counter options, there’s no reason not to pick one up and try it out. Dr. Miller wants you to be informed about every aspect of dental health, so here’s a guide to which whitening options can give your teeth a bright new shine. If you have any questions or would like to visit Discovery Dental for a consultation, don’t hesitate to give us a call. Nowadays, there are three basic types of in-home whitening: toothpastes and mouthwashes, whitening strips, and gel trays. While whitening toothpastes and mouthwashes are the least expensive products on the market, they are also the least effective at creating noticeable change in the short-term. This is because they don’t have a significant amount of the active ingredients in most whitening products, which are hydrogen or carbamide peroxide. However, they are effective at removing surface stains. On the other hand, gel trays and whitening strips can produce some serious whitening in as little as a week. Whitening strips are all the rage in Shelby, so we will focus on how they work and what kind of results you can expect from them. Whitening strips are made from a flexible plastic material called polyethylene. Each strip is coated with hydrogen and/or carbamide peroxide and an adhesive to keep the strips in place. Hydrogen peroxide oxidizes as it comes in contact with your teeth, which bleaches teeth, making the surface whiter. Carbamide peroxide works the exact same way, but has an acid that breaks up stains as well. 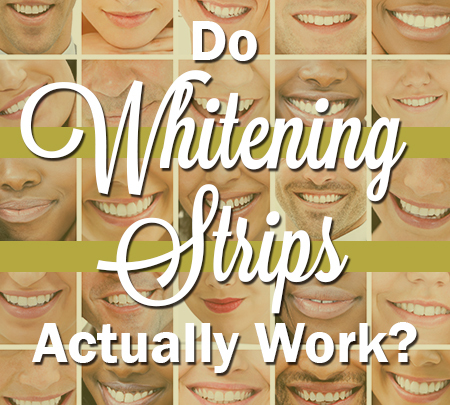 How Long Do Whitening Strips Take to Produce Results? Treatment times vary from brand to brand, but the average whitening strip package comes with 28 strips, for two weeks of whitening (one per night per row of teeth). Usually, the directions instruct Shelby residents to wear the strips for about half an hour before going to bed. Most people that try whitening strips notice a significant improvement in the whiteness of their teeth. However, they are not effective on tetracycline (antibiotic) or fluorosis (fluoride poisoning) stains, and they will not change the color of dental restorations. Although they more expensive, professional whitening treatments are much more effective, safer, and can usually be done in a single visit. If you would like to know about how Dr. Miller can give you a radically whiter smile in one visit, call Discovery Dental today.